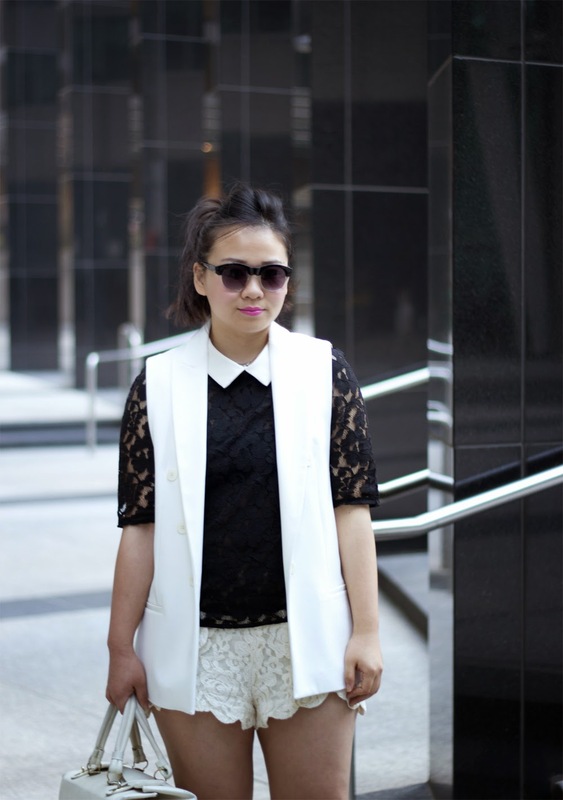 With today's look, I played with two of the most classic fashion elements- black and white combo + lace on lace ensemble to embrace the long-awaited spring weather. If you are following me on Instagram, you probably already knew the story behind this white lace shorts. Although it's a cute little piece, I have to admit that the vibe it brings out is too casual and playful, so how to transform it to a more adult appropriate look is definitely a challenge. It thus became the centre piece for me to play around with when putting this look together. While browsing through my closet, I found this lace top with a white collar and grabbed it without a second thought. But then, the look just got a little bit too predicable (a.k.a boring), so I decided to put on this sleeveless blazer I got from Zara last year which I have never gotten a chance to wear. Voila! The look instantly became completed and polished, and most importantly got rid of that beach feel and high school vibe. Very cute outfit! I love your pink shoes.